Is there Black tie event around the corner. You're going to need to wear a Tuxedo and will need a nice new wing tip tuxedo shirt. Sometimes you just gotta have a Wing Tip Tuxedo Shirt. Why rent something thats been worn by hundreds of people? Our Mens Wingtip Tuxedo shirts feature a mini pleated front and are Made of Poly/Cotton and comes with an adjustable black bow tie. Find more Formal Wear here. If you need a group order for tuxedo shirts for a catering company, hotel uniform or restaurant, never fear because Contempo Suits is here. 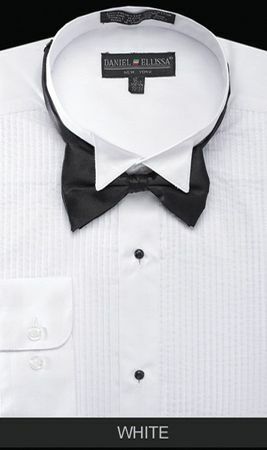 We can supply your catering company or hotel with pretty much as many tuxedo shirts as you need for everyone to be uniform in appearance making your company look it's very professional best. Mens Dress Shoes in tons of styles and colors here. Mens Godfather Dress Hats an look like a Boss.